Replace or rotate tires in accordance with maintenance schedules and treadwear. The location of treadwear indicators is shown by the “TWI” or “ ” marks, etc., molded on the sidewall of each tire. Check spare tire condition and inflation pressure if not rotated. Rotate the tires in the order shown. To equalize tire wear and extend tire life, Toyota recommends that tire rotation is carried out at the same interval as tire inspection. Vehicles with P215/70R15 and P265/70R16 tires: Do not fail to initialize the tire pressure warning system after tire rotation. Your Toyota is equipped with a tire pressure warning system that uses tire pressure warning valves and transmitters to detect low tire inflation pressure before serious problems arise. When new tire pressure warning valves and transmitters are installed, new tire pressure warning valve and transmitter ID codes must be registered in the tire pressure warning computer and tire pressure warning system must be initialized. Have tire pressure warning valve and transmitter ID codes registered by your Toyota dealer. ● Vehicles with P215/70R15 and P265/70R16 tires: When rotating the tires on vehicles differing with front and rear tire inflation pressures. ● When changing the tire inflation pressure by changing traveling speed or load weight, etc. ● When changing the tire size. When the tire pressure warning system is initialized, the current tire inflation pressure is set as the pressure benchmark. 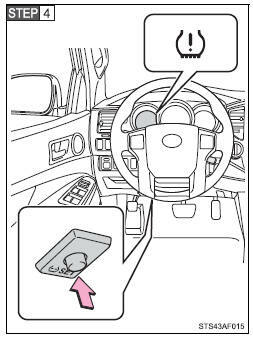 Park the vehicle in safe place and turn the engine switch to the LOCK position. While the vehicle is moving, initialization is not performed. Wait for a few minutes with the engine switch in the ON position, and then turn the engine switch to the ACC or LOCK position. If you are not sure, consult with your Toyota dealer. If the ID code of the tire pressure warning valve and transmitter is not registered, the tire pressure warning system will not work properly. After driving for about 20 minutes, the tire pressure warning light blinks for 1 minute and stays on to indicate a system malfunction. The effectiveness of snow tires is lost. Check that the number given by dividing the maximum load by 1.10 of the replacement tire is greater than 1/2 of the Gross Axle Weight Ratings (GAWR) of either the front axle or the rear axle, whichever is greater. For the GAWR, see the Certification Label. For the maximum load of the tire, see the load limit at maximum cold tire inflation pressure mentioned on the sidewall of the tire. Summer tires are high-speed performance tires best suited to highway driving under dry conditions. Since summer tires do not have the same traction performance as snow tires, summer tires are inadequate for driving on snow-covered or icy roads. For driving on snow-covered roads or icy roads, the use of snow tires is recommended. When installing snow tires, be sure to replace all four tires. All season tires are designed to provide better traction in snow and to be adequate for driving in most winter conditions, as well as for use year round. All season tires, however, do not have adequate traction performance compared with snow tires in heavy or loose snow. Also, all season tires fall short in acceleration and handling performance compared with summer tires in highway driving. For driving on snow-covered roads or icy roads, we recommend using snow tires. If you need snow tires, select tires of the same size, construction and load capacity as the originally installed tires. Since your vehicle has radial tires as original equipment, make sure your snow tires also have radial construction. Do not install studded tires without first checking local regulations for possible restriction. Snow tires should be installed on all wheels. Initialize the tire pressure warning system with the tire inflation pressure adjusted to the specified level. ●When operating the tire pressure warning reset switch, the tire pressure warning light does not blink 3 times. ●After carrying out the initialization procedure, the tire pressure warning light blinks for 1 minute then stays on after driving for about 20 minutes. The tire pressure warning system does not replace routine tire inflation pressure checks. Make sure to check tire inflation pressure as part of your routine of daily vehicle checks. For vehicles sold in U.S.A.
FCC WARNING: Changes or modifications not expressly approved by the party responsible for compliance could void the user's authority to operate the equipment. NOTE: Operation is subject to the following two conditions: (1) this device may not cause interference, and (2) this device must accept any interference, including interference that may cause undesired operation of the device. Observe the following precautions to prevent accidents. Failure to do so may cause damage to parts of the drive train, as well as dangerous handling characteristics, which may lead to an accident resulting in death or serious injury. ●Do not mix tires of different makes, models or tread patterns. Also, do not mix tires of remarkably different treadwear. 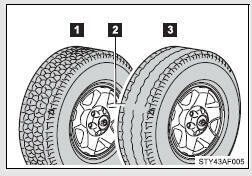 ●Do not use tire sizes other than those recommended by Toyota. ●Do not mix differently constructed tires (radial, bias-belted or bias-ply tires). ●Do not mix summer, all season and winter tires. ●Do not use tires that have been used on another vehicle. ●Do not use tires if you do not know how they were used previously. Do not push the tire pressure warning reset switch without first adjusting the tire inflation pressure to the specified level. Otherwise, the tire pressure warning light may not come on even if the tire inflation pressure is low, or it may come on when the tire inflation pressure is actually normal. ●When removing or fitting the wheels, tires or the tire pressure warning valve and transmitter, contact your Toyota dealer as the tire pressure warning valve and transmitter may be damaged if not handled correctly. ●When replacing tire valve caps, do not use tire valve caps other than those specified. The cap may become stuck. When a tire is repaired with liquid sealants, the tire pressure warning valve and transmitter may not operate properly. If a liquid sealant is used, contact your Toyota dealer or other qualified service shop as soon as possible. Make sure to replace the tire pressure warning valve and transmitter when replacing the tire. Take particular care when driving on roads with loose surfaces or potholes. These conditions may cause losses in tire inflation pressure, reducing the cushioning ability of the tires. In addition driving on rough roads may cause damage to the tires themselves, as well as the vehicle’s wheels and body. Do not continue driving, or your tires and/or wheels may be ruined.